Los Angeles is a multi-cultural mélange of ethnicity represented by people with roots around the globe, but unlike major cities on the east coast there's a lack of an Italian presence. Back on the east coast you didn't have to stray far to find yourself caught up in the revelry of the round-the-clock gastronomic overload of Saint Anthony's Feast, or the gluttonous decadence of the Feast of San Gennaro (both resplendent celebrations in the streets and a damned fine excuse to stuff yourself like a calzone). Where does one go in the L.A. area to immerse one's self in the Italian experience? Fuggedaboutit! How does San Diego rate a Little Italy and San Francisco deserve a North Beach while L.A. languishes without a major Italian presence? 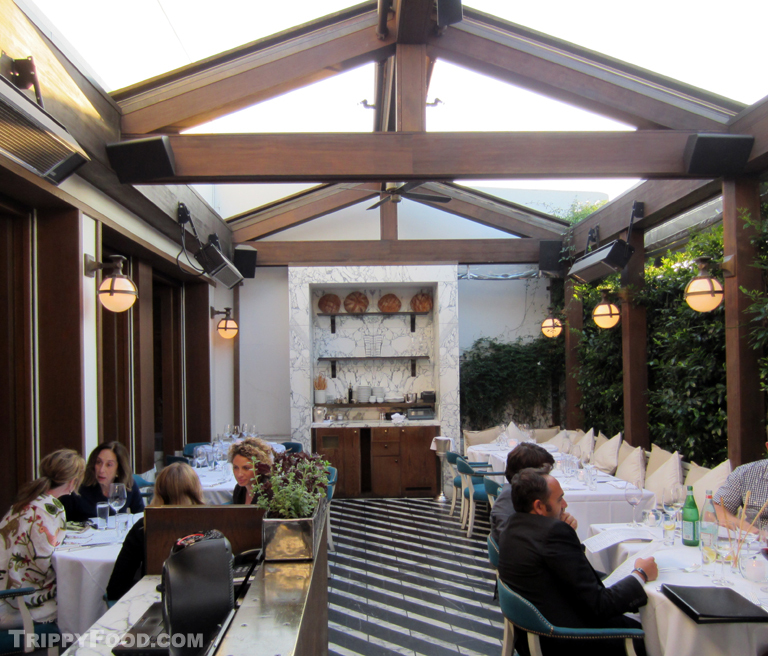 Until we start installing bocce courts in Westwood and erecting rose trellises around bathtub B.V.M.Ms on lawns in Glendale, we'll have to settle for the old world charm of Cecconi's in West Hollywood. Twin palms stand guard at the opening in a towering hedge wall, a portal to a slice of Italia sorely lacking in L.A. The space is part formal, part rustic, part lounge - the wings at the front are open air with white country hutches at either end decorated with loaves of artisan bread the size of your head. 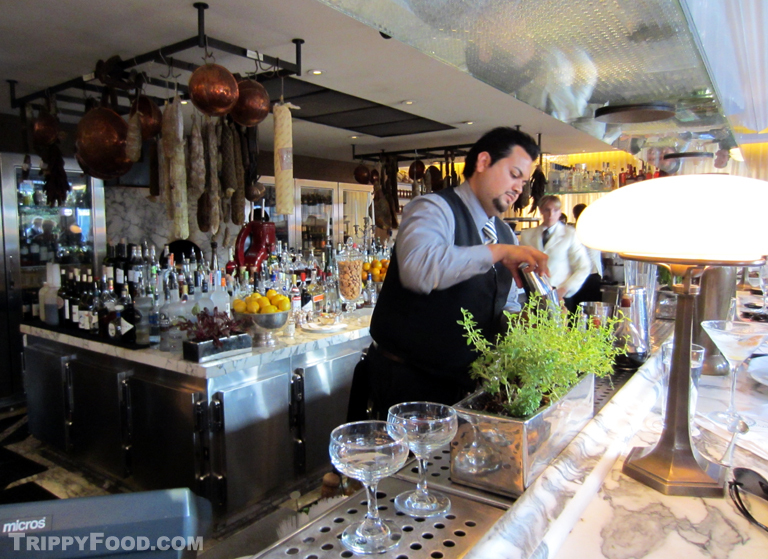 The atmosphere lends itself to memories of dining al fresco in the country until you pass through to the bar, a busy and cluttered marble-topped control center where fresh herbs grow on the counter and salami, meats and cheeses hang from the interior. The libations are both innovative and traditional where you can order signature cocktails, drinks by request or simply trust the bartender. 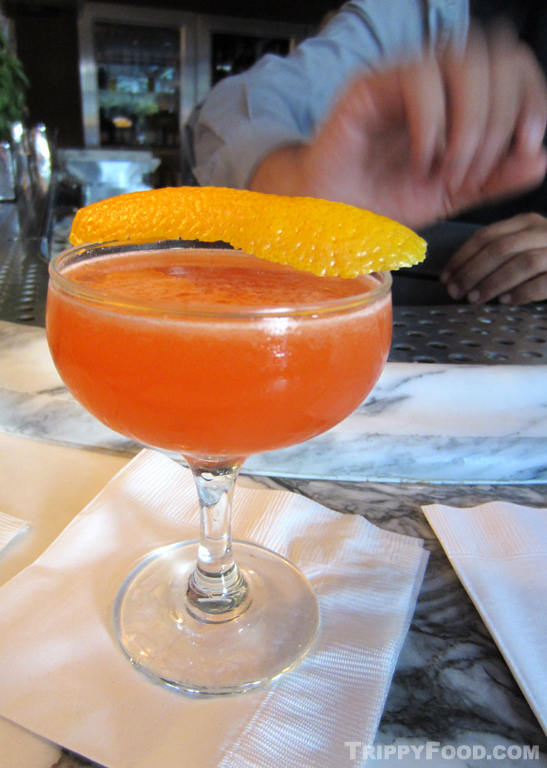 On my visit I tasted the elementary named "Intro to Aperol" a refreshing tangy blend of Aperol, gin, lemon juice and angostura bitters with an orange peel balanced on the rim torched to release citrus aromas. Aperol was in ample supply - one syrupy drink not on the menu with the Italian moniker of "Sicilian Flower" blended St. Germaine, Aperol, Carpano Antica vermouth and Averna, again with the flamed twist (things have a way of catching fire, if you catch my drift). The Watermelon Paradise started with gin and cucumber with watermelon juice ginger syrup then christened with a basil leaf and cracked black pepper with the result looking like a pink shaved ice in a glass. To the left of the bar is a dining area illuminated by retro chandeliers and subtle yellow recessed lighting; a private dining area is separated from the main area by what looks leaded glass panels with a large orange heart on the back wall, a room where Frank (last name not necessary) would be at home entertaining. We chose the more austere and comforting outdoor area for dining; the one drawback is that as the night progresses, some of the visual excitement of the cuisine is lost. Small dishes of sharable cicchetti started arriving at the table; meatballs that nicely blended beef, veal and pork in a light tomato basil sauce were served a la carte but it would have been sinful to confuse the taste by crowning pasta with them. 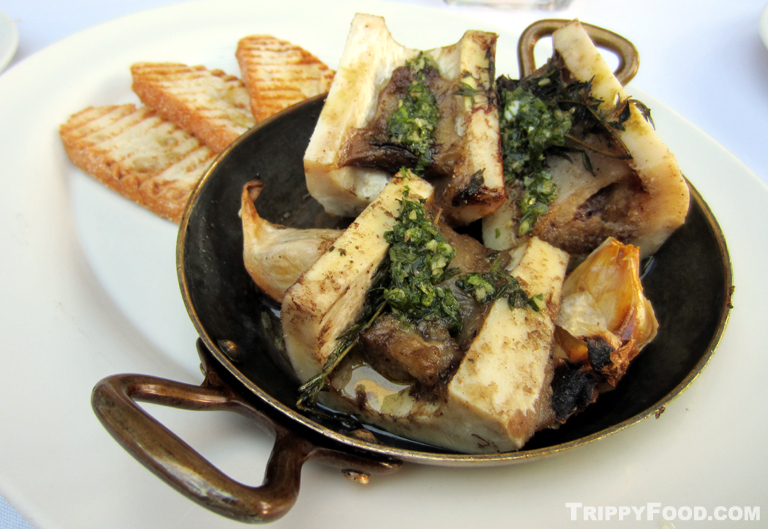 A plate of stacked marrow bones opened lengthwise looked like the spoils of a victorious battle and fortunately the rich essence of the greasy beef substance was not melted away. Crispy fried shishito peppers and anchovies were a snack-like curiosity; a puree of fava on bruschetta with aged Pecorino shavings was a delightful combination of textures with the sharpness of the cheese complementing the creamy legume spread and was the perfect partner for a rare tuna crudo and avocado crostini. The gnocchi Romana in gorgonzola cream sauce was like an Italian mac and cheese - the gnocchi melted away like mashed potatoes leaving the cheese as the prominent taste and the zucchini flowers stuffed with goat cheese were a colorful and fanciful taste treat. There was a cavalcade of dishes brought out, each with urging from the staff who in true Italian fashion acted like my grandmother ("Finish that! There's more coming!"). Baby scamorza cheese and zucchini calzones looked like empanadas but were a world apart in taste, and a cheese pizette arrived plain but was treated to a shower of rough grated black truffle to create an aromatic explosion of flavor on a crispy dough palette. I could have thrown in the tricolor towel then and there, but this is Italian cuisine we're talking about and the hits kept coming and became more substantial. 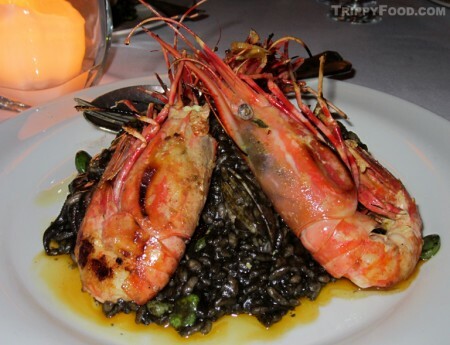 As dark as the dining area, a mound of sepia risotto was accented with cuttlefish and clams with giant grilled prawn laying atop - in the dim light the legs and antennae gave the appearance of some odd spider, and the taste was dark, murky and decadent. The prawns were soft and creamy inside and the seafood didn't overpower the risotto, but I came close to biting into a still-closed clam, hidden in the darkness of the squid ink. The item was not currently on the menu but I was fast losing track of what was and wasn't. The interaction with the staff was as enjoyable as the cuisine; it seemed like a flock of employees came out to release a rock salt encrusted sea bream from its salty tomb. The baked fish was simply prepared with the salt paste held together with egg white and accented with rosemary and mint; the fish itself had only a light application of lemon and herbs. To my amazement, once the fish was extracted from the salt crust even when some of the grains ended up on the flesh it was not overly salty. 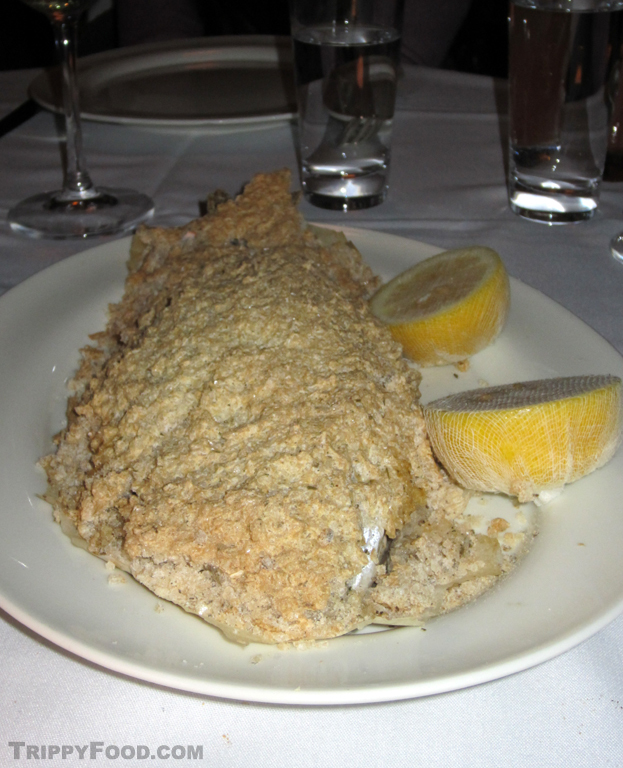 Another item not on the menu was grilled Dover sole in a lemon caper sauce that is offered as a special item once a week when it is flown in fresh (on Air Italia, no doubt); the two fish items were different enough in taste to not be redundant. In keeping with the seafood theme, we sampled a crab gnocchi dish with peas and saffron. Most of the flavor came from the fresh lump crabmeat with the gnocchi having an almost negligent texture. The only pasta dish we encountered was a rich and creamy agnolotti Del Plin, which (unlike us) was lightly stuffed. 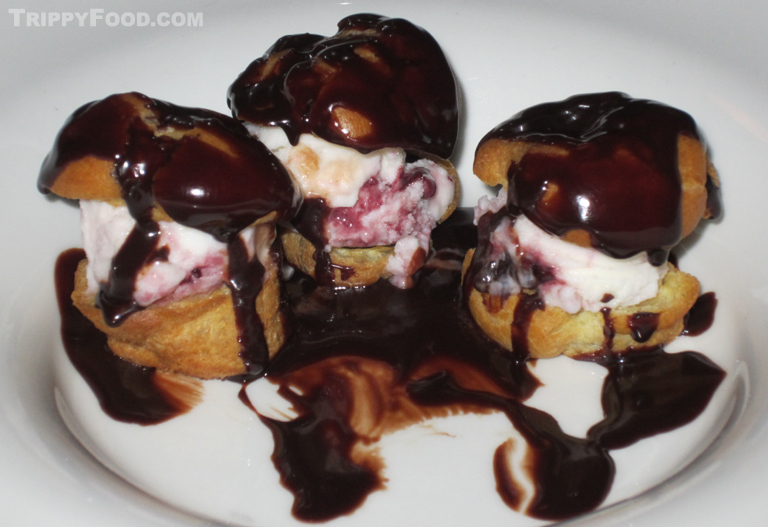 Keeping in mind that this is an Italian restaurant, a fleet of desserts arrived at the table that included cannoli with pistachio, ice cream-filled profiterole, a warm, moist strawberry shortcake and a panna cotta topped with fresh berries. This entry was posted in Europe, Trippy Food (Tasty flora and fauna) and tagged agnolotti, Aperol, bones, bruschetta, CA, California, calzone, cannoli, Cecconi's, cheese, cicchetti, crab, crostini, crudo, Dover sole, fava, Gennaro, gnocchi, Gorgonzola, Italian, Italy, L.A., Los Angeles, marrow, meatballs, Pecorino, peppers, prawn, profiterole, risotto, Saint Anthony, sea bream, shishito, tuna, West Hollywood, zucchini flowers. Bookmark the permalink.